After watching a show about cats, Choco decides she wants one, but Haruma says that they can’t get a pet. They’re not allowed in the apartment. Meanwhile, some shady-looking men are driving around with a puma caged in the back of their truck. They get into an accident and the puma escapes. When Choco goes out, she’s sad to see several people with their dogs, but notices a stray cat and chases after it. She follows it to an abandoned building, only to see it run out in horror. Investigating further, she finds that the puma is living there. Rather than being afraid, Choco is excited to see a big cat. She offers it some corn, which it turns down, but then takes out a bag of mini sausages. The puma likes that and wants more. Eventually she has to get more food, so when she returns home, she looks for some money. There’s not much though. Later, Haruma discovers that his wallet is empty. Tamami buys him lunch, but makes him do another job for payment. He has to cosplay as Odairi to help sell her new album. Meanwhile, Choco convinces Kakeru to help her buy food. They go to see the puma, whom Choco’s named Kuro. Kakeru freaks out upon seeing just what kind of cat he is. Choco explains to him that based on what her notebook says, Kuro matches the physical description of a cat. Still, Kakeru is afraid of Kuro. One day, Yurika hears Kakeru talking. Of course, she’s not happy to see that Choco is with him. She decides to follow them. She reveals herself and goes to see who “Kuro” is, eventually fainting from the shock. Later, while keeping her distance, Yurika yells at Choco for this, but Choco defends Kuro. 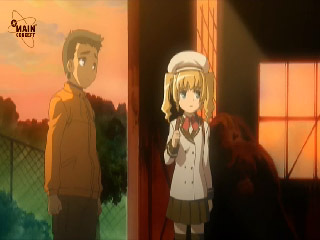 Yurika gives in and approaches Kuro again, but is still afraid. However, Kuro just licks her, so she feels a bit better about him. 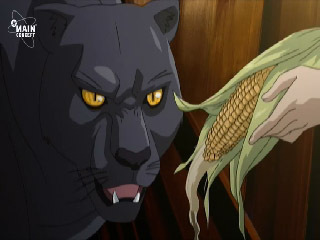 The next day, Yurika brings Kuro’s dinner. However, only Kakeru is there. 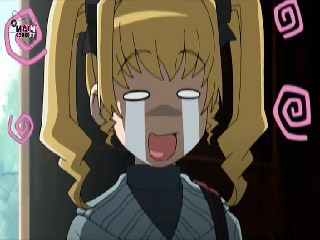 The fact that Yurika refers to him as “Kuro-chan” surprises Kakeru. That night, Kuro wanders off. Makoto passes by him when returning home, but is too drunk to notice. Choco is surprised to see Kuro out her window, but hides the fact that he’s there from Haruma. Choco goes out to him, telling him that he can’t be here, but that she’ll bring him dinner tomorrow. After seeing Kuro off, she goes back inside. In the morning, after Haruma leaves, Choco sees something horrible on the news. A large black cat had been hit by a car. She rushes to Kuro’s home to check on him, but he’s not there. She starts to cry hysterically. Kakeru and Yurika eventually arrive and see Choco crying. Kakeru goes to get Haruma. Choco tries to tell him what happened, but Haruma knows. He stays to comfort her. That night, Haruma lets Choco sleep with him. Choco still remains very upset about Kuro. That was so depressing. Forget all the episodes at the halfway point. This was the most depressing, painful episode in the series. After so many cute, happy episodes, it really threw me off guard. Kuro was adorable. I mean, I knew there was no way that Choco would be able to keep him, but I didn’t expect them to how this by killing him off. That was a terrible way to do it (terrible in a depressing way, not that it was a bad ending.) It certainly broke the cliché that could’ve occurred, but I still wish they didn’t have to kill him off. On a les depressing note, the majority of this episode was cute. 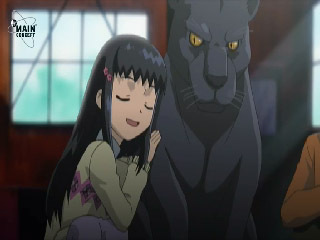 I’m glad Kuro was a tame puma rather than a vicious one, because it made him all the more adorable. It was also amusing to see Kakeru and Yurika’s initial reactions to Choco’s pet. Of course they came to like him. Darn, I can’t say much else other than the fact that this was really, really sad. Next time, everyone goes to an amusement park. I guess a cheery episode after this is the only way to go.